Dear readers, Wovember 2013 has arrived! Another round of Woolly Wonders to be shared with the world. Like last year, I will be working hard, together with Kate Davies and Felicity Ford, to celebrate wool in all its myriad aspects. This means I will be a bit quiet on my own blog. You can join in with the fun over at WOVEMBER! That said, I’m planning to track my WAL progress here. What is WAL? 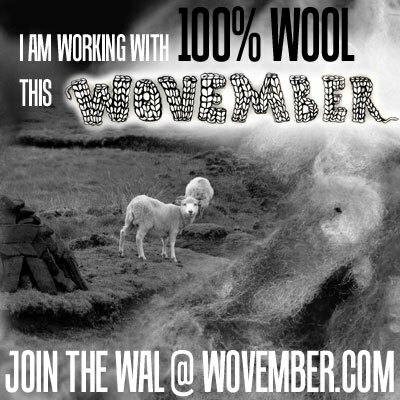 A WAL is a Wool-Along, where we invite Wovember blog readers to join in on a woolly project of your own choice, for the month of Wovember. More details on the Wovember blog. I’m going to work on a new pair of woollen trousers, using a herringbone tweed I bought at the Jamieson’s of Shetland mill in Sandness, my first ever machine-knit cardigan, also in Shetland wool, and last but not least, I’m already working on a Fair Isle cardigan in Foula Wool. Come join us in a woolly project. What will you be working on? I’m handspinning Shetland fleece at the moment that I got whilst up there (live in North Wiltshire) and am knitting with it and some Teeswater yarn from the Pilkingtons at Higher Gills Farm in Lancashire. I’m going to sort, wash and card some fleece, which will be a first for me. My OH came home with 2 lovely Manx fleeces this summer, then I’m going to attempt to spin it. I’m only a very novice spinner so we’ll see how it goes. I might even be able to knit some up! Be sure to keep us up-to-date over on the Wovember blog. Good luck!